If you’re getting married in Seattle, chances are that you already know about all of the cool things that make the city unique. 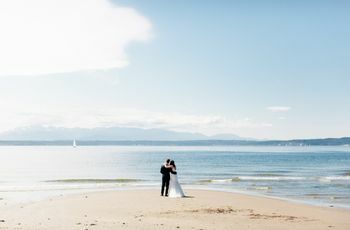 Whether you're in search of the best Seattle wedding venues, a team of expert wedding vendors, or memorable experiences for your guests, there's something for everyone here. From the city's roots as a musical birthplace to being home to the most famous coffee shop in the world, Seattle has always been a trendsetter — and now it's your turn to take advantage of its one-of-a-kind character! Make your big day unforgettable with these must-see Seattle wedding venues and trendy ideas. Only in Seattle can you find a real treehouse that doubles as a wedding venue. 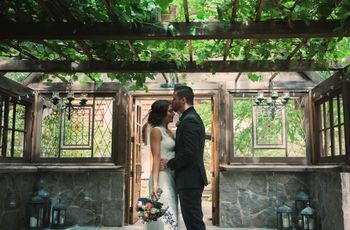 Treehouse Point in Issaquah is an easy 30-minute drive from downtown, but its secluded location is what makes it completely stand out from other Seattle wedding venues. 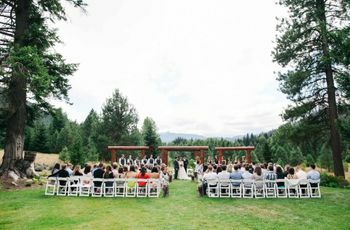 The lush Washington forest creates a cozy setting if you’re looking to escape the crowds of the city on your wedding day — plus, we’re predicting that forest wedding venues are the new rustic barns for 2018. 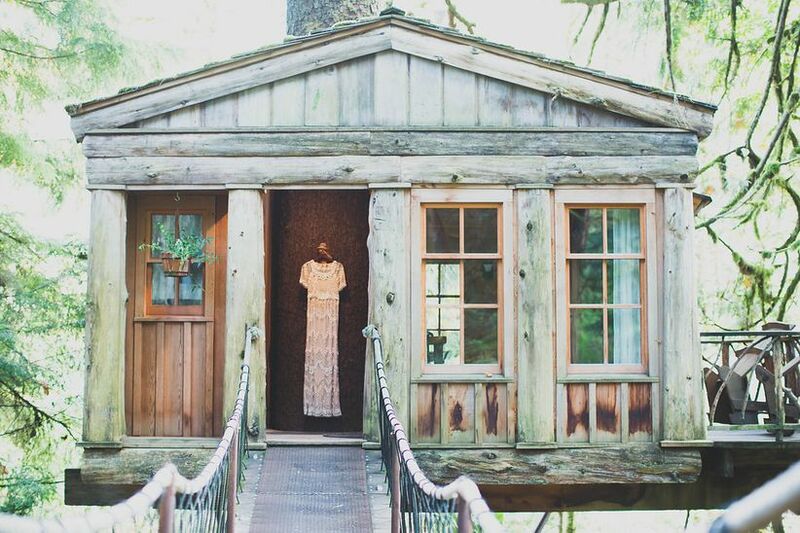 Couples who rent Treehouse Point for their wedding are given exclusive access of the four-acre property, which includes seven standalone cabins and one main house, called “The Lodge.” Treehouse Point can comfortably host 18 guests overnight, but it is also one of our favorite Seattle wedding venues if you’re planning to elope. 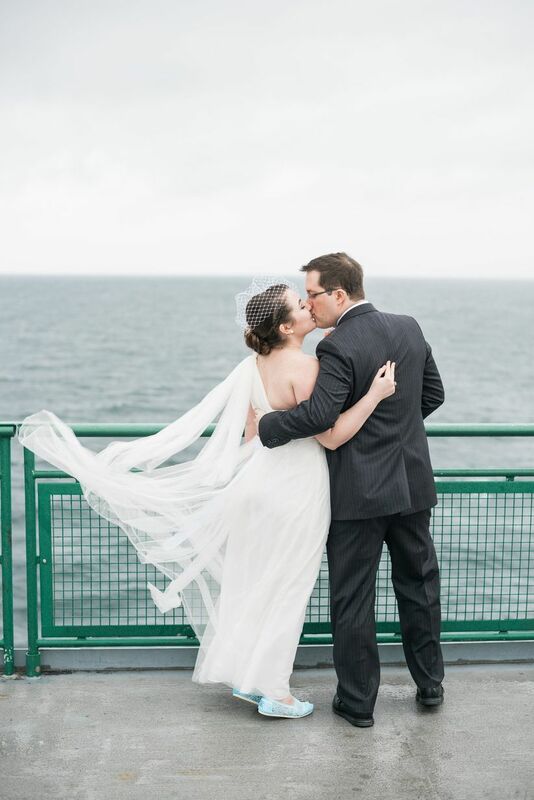 If traveling by sea is more your style, then consider getting married aboard one of Washington’s commuter ferries. A floating wedding venue is no doubt an unexpected choice, but it’s sure to make for a memorable and beautiful wedding — and one that is totally “Seattle,” since commuting to work via ferry each day is popular with the locals. The Washington State Ferry travels from Seattle to Bainbridge Island, with unbeatable views of the Seattle skyline along the way. See how this couple pulled it off. Seattle’s bustling food truck scene is one of the city’s best kept secrets, since it’s usually overshadowed by other hip locales known for their food trucks, like Portland and Austin. 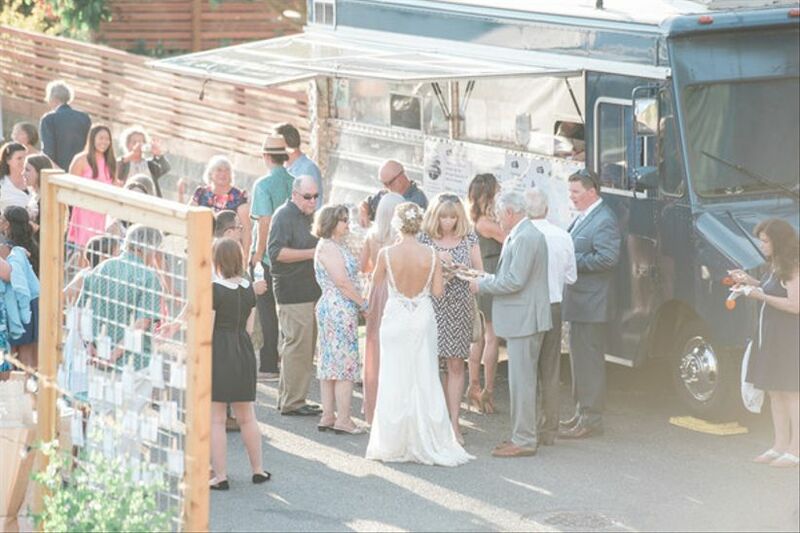 Whether you hire a food truck for a cocktail style meal or as a late-night surprise for your wedding guests, there’s something for everyone. If you can eat it, there’s probably a food truck for it in Seattle! From Caribbean cuisine to French crêpes, handmade donuts, and gourmet ice cream, the options are pretty much endless. From our Seattle real weddings, we’ve seen that the local wedding vendors truly know their stuff. 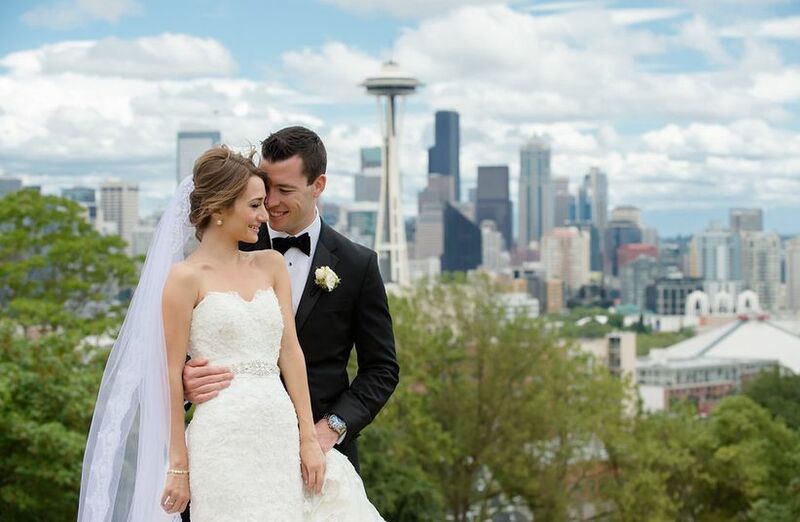 Seattle is filled with creative and talented people, and getting married in the city gives you access to some of the best florists, caterers, bridal shops, DJs, event planners, and more. 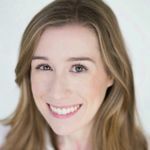 Trendsetting brides can find the wedding dress of their dreams at The Dress Theory in Seattle, which stocks some of the coolest designers such as Hayley Paige, Alexandra Grecco, Anna Campbell, Galia Lahav, and Jenny Packham. Another thing we love about Seattle is the city’s commitment to using locally-sourced goods. 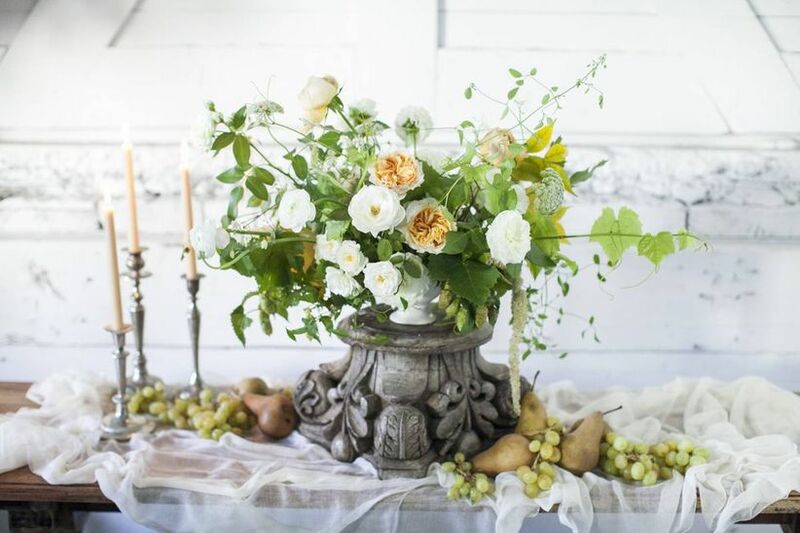 There are plenty of Seattle wedding vendors who can help you create the wedding of your dreams while also supporting local businesses, whether that means creating a farm-to-table wedding menu or hiring a florist who uses flowers grown right there in Washington. Thanks to its history as a logging city, railroad terminal and shipbuilding port, there are tons of unique wedding venues in Seattle with industrial architecture. Luckily for couples getting married in Seattle, historical and industrial wedding venues are a major trend right now. Sodo Park in Seattle is a repurposed factory building with modern and rustic elements, including exposed beams, vaulted ceilings, reclaimed chandelier lighting, dark hardwood floors, and large industrial style windows. 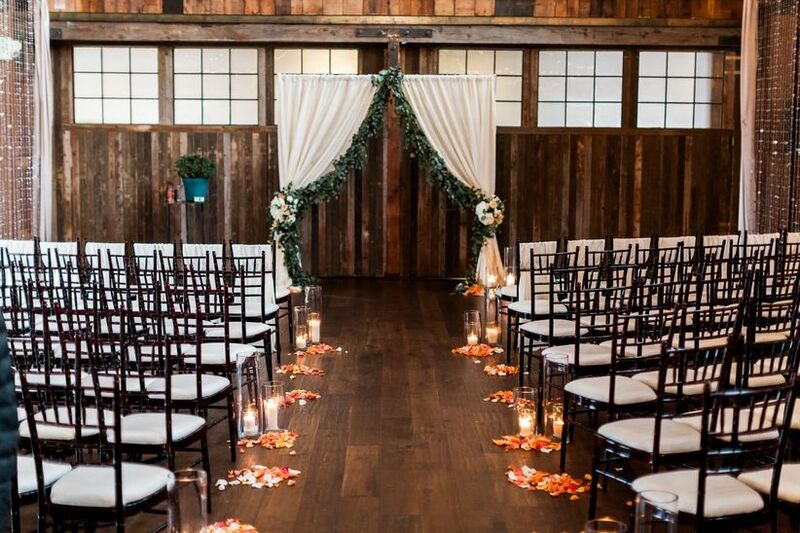 The venue has more than 7,000 square feet of floor space for your ceremony or reception. 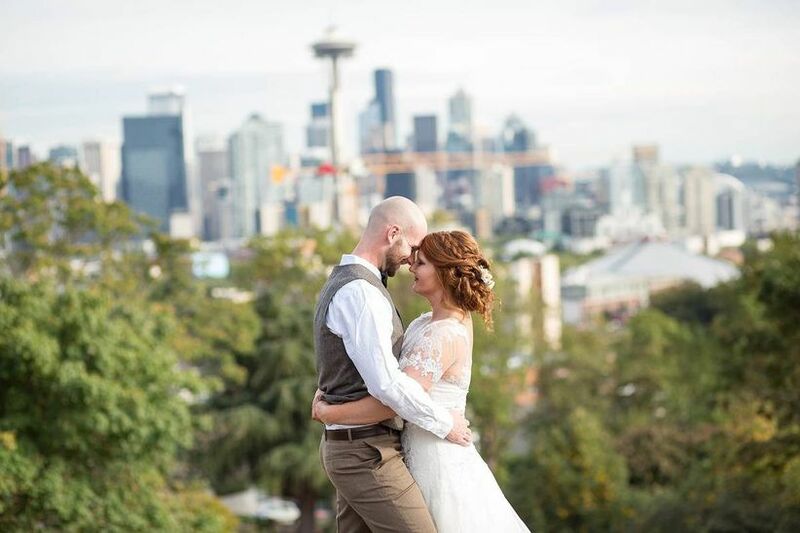 Metropolist is another modern Seattle wedding venue that we love. The event space is airy and spacious, with funky Edison bulb chandeliers, bistro string lights, floor-to-ceiling windows, and vaulted ceilings. Whether it’s stouts or espressos, Seattle loves its brews. After all, the city is known for being the birthplace of Starbucks — although if you’re a local, you probably have your own favorite spot to grab the perfect cup of coffee. Seattle also has a lot to offer for beer lovers, with microbreweries constantly popping up around the city. One of our favorite Seattle wedding ideas is showcasing your love of coffee or craft beer (or both) throughout the day. 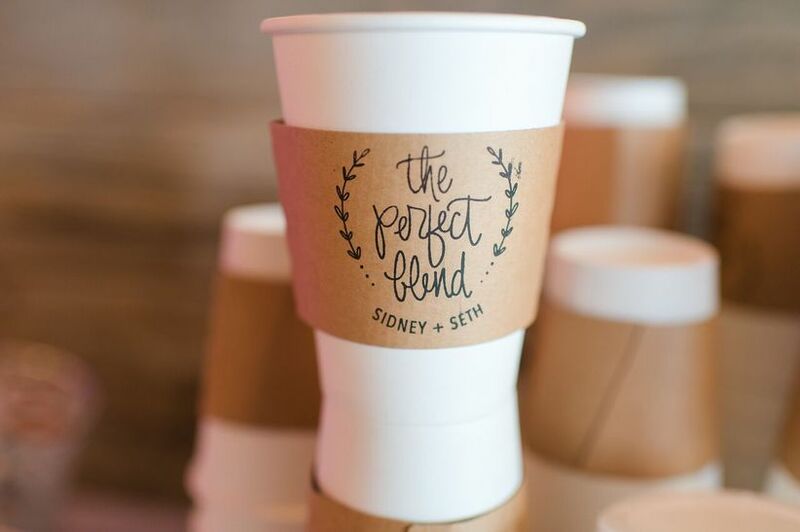 Serve your favorite local brew as a signature drink, or create your own custom coffee blend as a creative wedding favor. 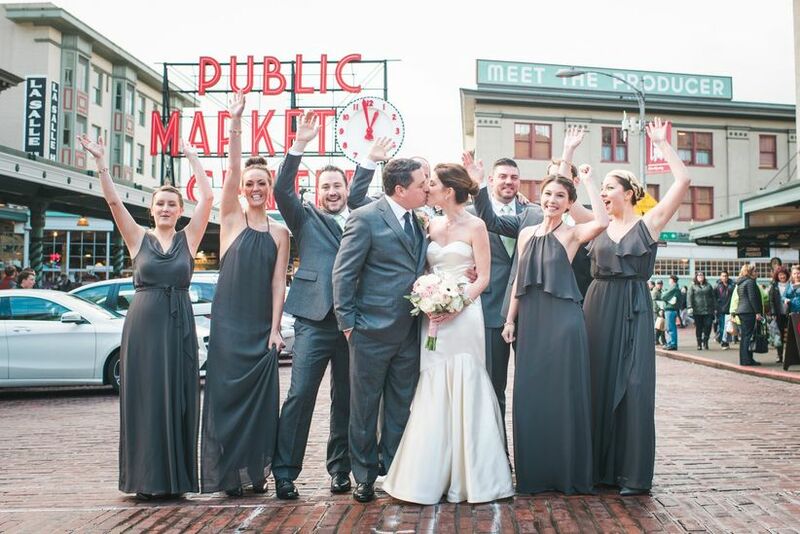 If you’re considering Seattle for a destination wedding, you won’t want to miss all of the photo ops at the city’s famous Pike Place Market. This huge market is known for its smorgasbord of vendors, from niche food stalls to craft shops and the ever-so-entertaining fishmongers who shout out customers’ orders and throw fish through the air to each other (yes, really). While we don’t necessarily suggest getting too close to any fish while dressed in your wedding best, the market’s iconic sign is a one of our favorite places for Seattle wedding portraits, along with the nearby street art (or original Starbucks store if you’re a coffee lover). Even if you’re a local, it’s worth a trip to the market to grab a few priceless snapshots. From quirky ‘90s rom-coms to a 2000s vampire phenomenon, Seattle and the surrounding Washington scenery have been the inspiration for some major Hollywood blockbusters. First there was Sleepless In Seattle and 10 Things I Hate About You, then came the Twilight saga followed by Fifty Shades of Grey. Several television series, including Twin Peaks and Grey’s Anatomy, are also based here. Seattle is a major player in the tech industry too, with Amazon and Microsoft both headquartered in the city. It is also renowned for its music scene — Pearl Jam, Nirvana, Macklemore, and Modest Mouse are just some of the names that got their start in Seattle. 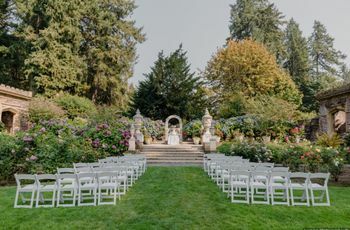 With such a star-studded past, it's no surprise that there are a number of unique wedding venues in Seattle that have also been used as filming locations! Gas Works Park, Thornewood Castle, Chihuly Garden and Glass, and Lake Union are just a few. Seattleites know the importance of preserving Mother Earth, which is why the city is constantly named as one of the most eco-friendly places in the U.S. From the numerous weekly farmer’s markets stocked with organic goods, to the city’s recycling and energy conservation efforts, Seattle is at the forefront of the green movement (coincidentally, Seattle’s nickname is “The Emerald City”). If you’re looking for eco-friendly wedding ideas, you’ll find no shortage of them here. 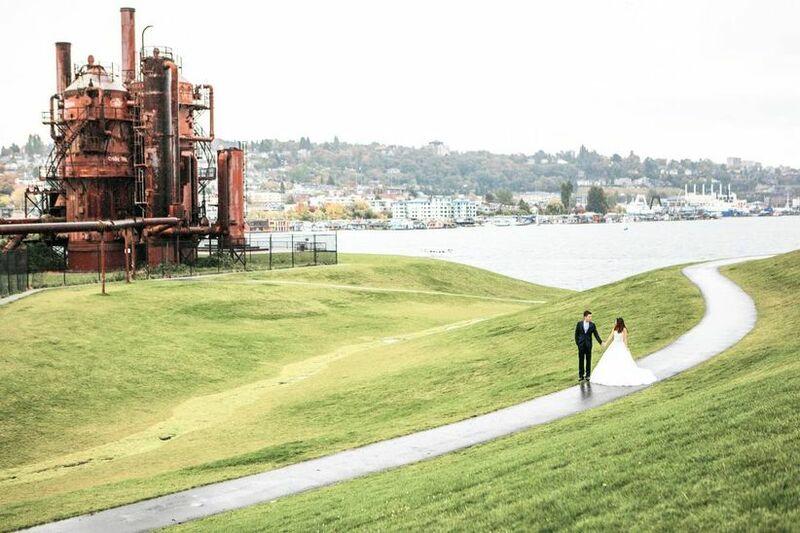 Some of our favorite Seattle wedding venues are the city’s public parks, especially Gas Works Park. This one-of-a-kind spot, located on the north side of the city, is the site of a former oil plant. Many of the plant’s pieces are still standing, making the 20-acre park an unexpected backdrop for an outdoor wedding. Gas Works Park sits on the shore of Lake Union and has an unobstructed view of the Seattle skyline.